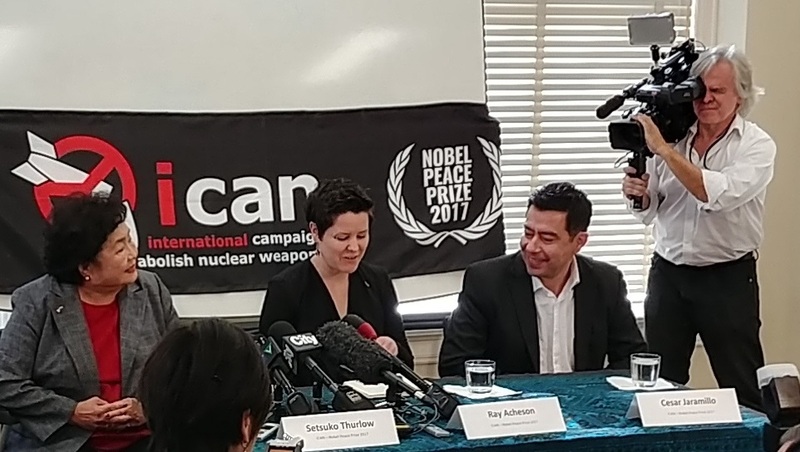 Mennonite Central Committee (MCC) congratulates Project Ploughshares, a member of the International Campaign to Abolish Nuclear Weapons (ICAN), on winning the 2017 Nobel Peace Prize. Project Ploughshares, of which MCC is a member, was started 42 years ago by a former MCC service worker, Ernie Regehr. Cesar Jaramillo, the executive director of Project Ploughshares, says Project Ploughshares is honoured to be one of several civil society organizations affiliated with ICAN who are recipients of the prize. The coalition was awarded the prize for its role in negotiating the UN Treaty on the Prohibition of Nuclear Weapons. In July, the UN passed the treaty, the first legally binding international agreement to compre-hensively prohibit nuclear weapons, with the goal of their total elimination. More than 50 countries have signed the treaty. For those nations that are party to it, the treaty prohibits a full range of nuclear-weapon-related activities, including undertaking to develop, test, produce, manufacture, acquire, possess or stockpile nuclear weapons or other nuclear explosive devices, as well as the use or threat of use of these weapons. But the U.S. and other nuclear-armed countries and their allies, including Canada, stayed out of the negotiations. Many have said they do not intend to ever become party to it. The esca-lating tensions between the U.S. and North Korea prove there is still work to be done.